As the above examples illustrate, if day, feast, festival, or the like occur in the official title of the day, the term should be capitalized. If used generically (e.g., the feast day or New Year’s festival), the term should be lowercased. Likewise, a generic designation such as new moon should be lowercased (see SBLHS §4.3.6). Some modern translations lowercase the term Sabbath, while others capitalize it. 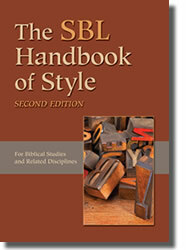 Although one might argue for the lowercase on the basis of the term’s generic usage, SBL Press capitalizes Sabbath in keeping with its listing in our preferred dictionary, Merriam-Webster’s Collegiate Dictionary (11th ed. ).